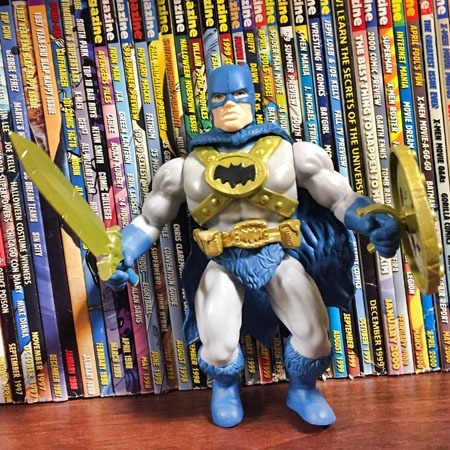 Over the weekend, I had a chance to get to a quasi-local (for me) convention–Halloween Comic Con, hosted by The Pop Shop in Sandusky, Ohio. Prior to even going to the event itself, a friend gave me a few things he’d had for me, including a couple of Ultimatum hardcovers he’d picked up for me some time back! 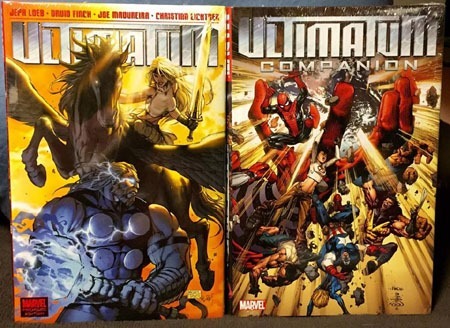 The main Ultimatum volume has Ultimates 3 and Ultimatum itself…unfortunately, does not have the Annuals that were collected in the March on Ultimatum regular-sized hardcover. 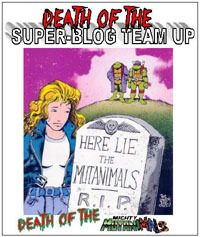 The Ultimatum Companion includes tie-in issues in the run-up to, during, and after the event for Ultimate Spider-Man, Ultimate X-Men, and Ultimate Fantastic Four; it also includes the Requiem issues for those titles. 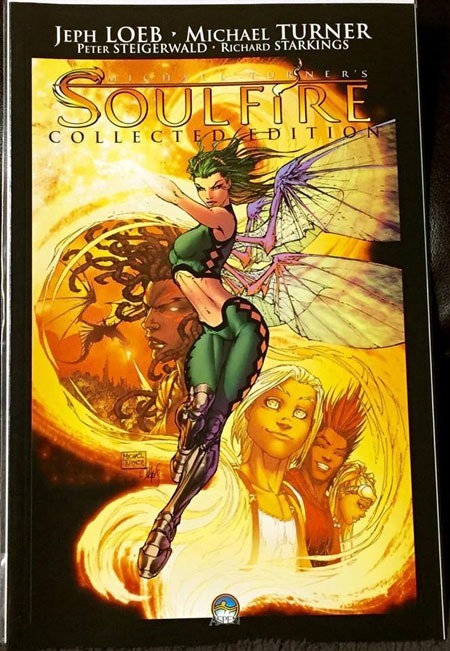 Free with admission we got this Soulfire Collected Edition volume. Nothing overly special (to me), but as a freebie…not bad at all! 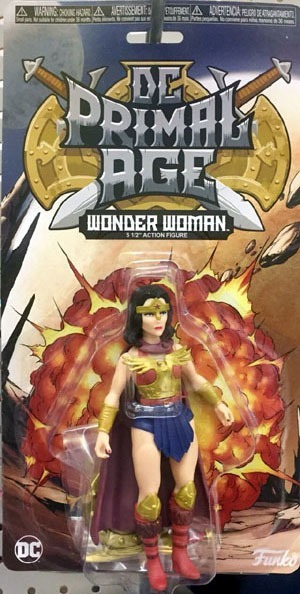 Unfortunately, none of the other figures in this wave were present… I’m not a huge fan of this version of Wonder Woman, but Flash, Green Lantern, or especially the Captain Marvel figure would also have been great scores! 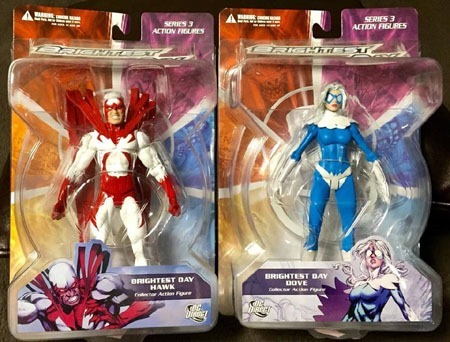 I initially made a mental note of the Hawk and Dove figures, though didn’t spring for them right away. Once I’d had a chance to wander the tables, and we were about to leave, I doubled back to check, telling myself they were a set. I would buy both if they were both still present, leaving whichever one was there if someone had already bought the other. Needless to say…they were both still there, and I snagged ’em. 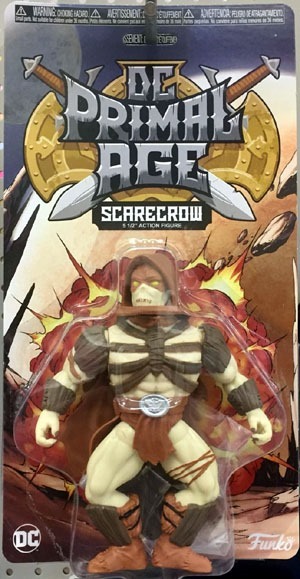 Neither figure is that remarkable or interesting to me on their own…but the two of them, together, are really freaking cool to me! 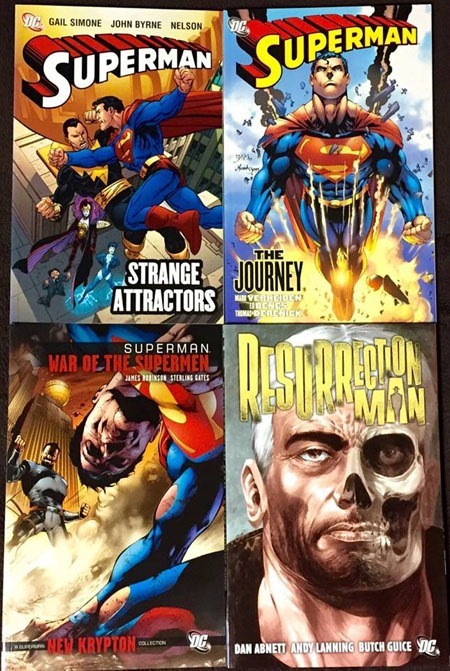 The Superman figure above and these four volumes were part of a $5/ea or 5/$20 deal. There’s a whole bunch of Superman paperbacks I’d like to own, but not enough to pay much for. At the same cost as a Marvel comic, though…I’m quite willing! The Resurrection Man volume “rounded out” the deal, and for the price and having 14-ish issues (from the original 1990s run), not bad at all! 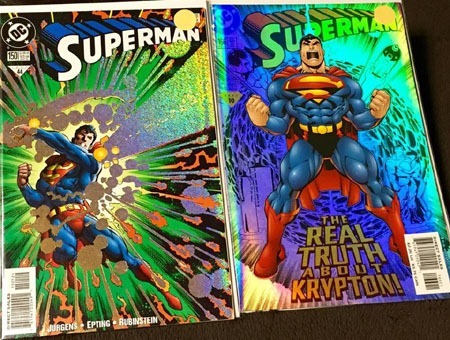 Moving on into stuff, I snagged a 2nd copy of Superman #s 150 and 166 with the extra-shiny-ness thing going on. For the price, I was sucked in with the shinyness and the relative rarity…as in this is only the second time I can think of that I’ve seen this version of #150; and my original copy of 166 suffered some unfortunate rolling/bending years back being in the back of a longbox. For under $2/ea, glad to double-up! 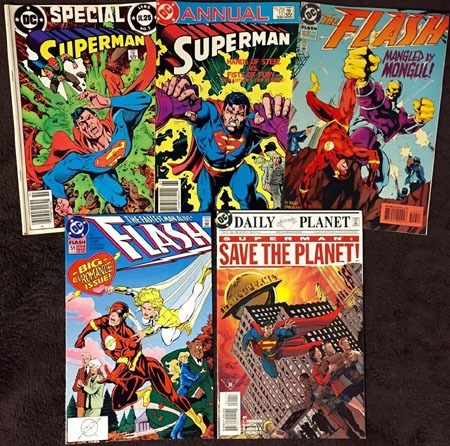 For “50 cents each or 5/$2,” I added an extra copy of the Superman: Save the Planet! special to the other four issues that had my attention. While I’d made sure ahead of this convention that I had my Ultraverse and TMNT comics sorted and missing issues logged…I neglected to log my stack of DC One Million issues…and unwilling to spend the extra $1 or 50 cents or whatever they would work out to on yet more doubles of those, I probably passed on a simple score of wrapping up my set of DC One Million. 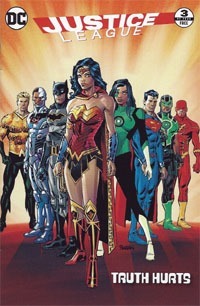 That said…I snagged the DC One Million 80-Page Giant as well as what I hope is only a 2-part DC Two Thousand. 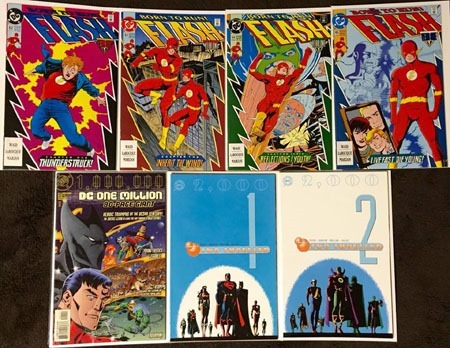 I’d hoped for Flash: Terminal Velocity (the run-up to #100) but the stock skipped from the early 50s to the 120s…I settled for the four-part Born to Run story, as I couldn’t remember if I had the single issues or not. 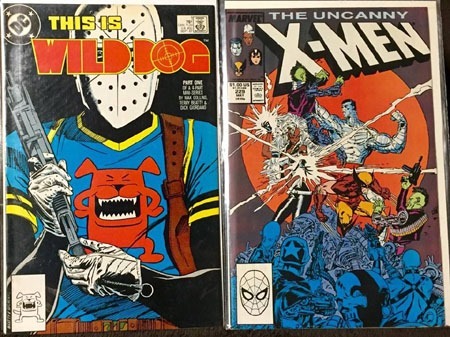 I believe I dug the Wild Dog and Uncanny X-Men issues out of a $1 bin. Hearing the character will be apparently playing a role in this season of Arrow and the surprise reference in another title recently, I figure I’d be glad to have this issue (unfortunately, they did not have the other issues of the series). And with the rumour of stuff for the upcoming Logan film (aka Wolverine III), I wanted to be sure to snag Uncanny X-Men 229 before it pulls a 266 in pricing on me! 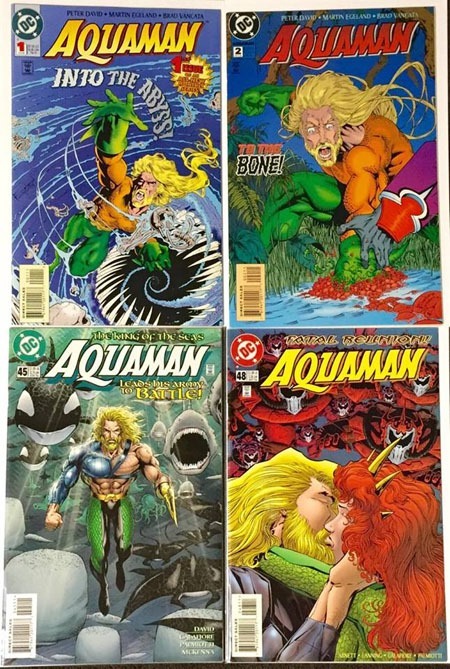 For the price of a single Marvel comic, I “upgraded” Aquaman #1 from a beat up copy to a nice copy…and filled out my Peter David run to now having a full run of #0 & 1-48! This includes “the” key issue–#2–where Arthur loses the hand…and I danced a fine line taking these photos between not actually sitting to read #s 1-3 and 0 and skimming through #2 and #0 in particular! 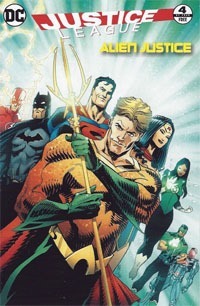 I remember when this series started, as well as noting Aquaman’s appearance in Zero Hour itself (see my 2016 Zero Hour Revisited posts), but had never gotten into/kept up with the series, to my later regret. 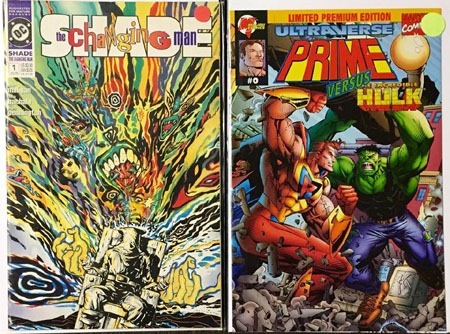 Gladly, with ’90s comics being so (financially) cheap, I’ve embraced being able to catch up at a fraction of even the original cover price cost! My friend and I found a table with a huge selection of ’90s 25-cent comics. 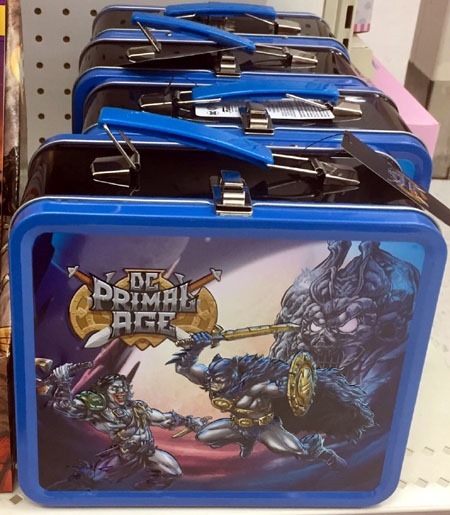 The listed deal was something like 25 cents each, so many for $2, or fill a USPS priority box for something…he saw us both amassing a decent stack, and made us a deal to go in one one together…so sharing the cost, we proceeded to grab some extra issues we’d passed on…and filled a box. 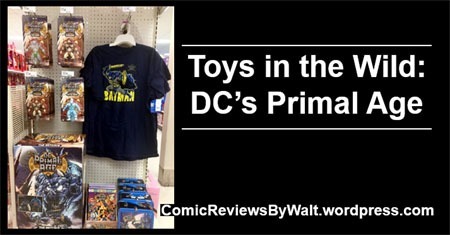 Lotta cool/fun stuff…especially for less than 25 cents apiece! 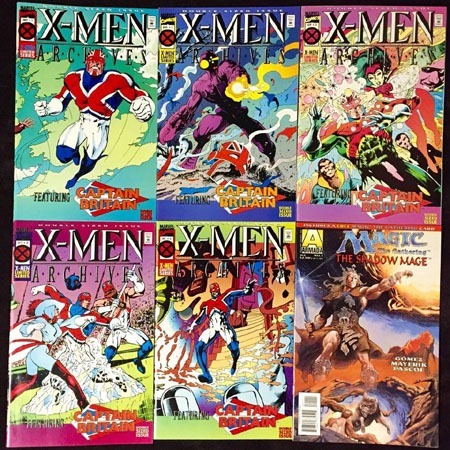 I have (somewhere) a couple issues of the X-Men Archives, and apparently grabbed 5 of the 6 here. 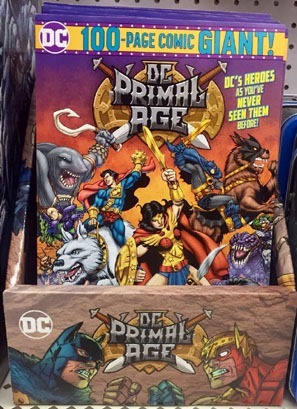 My friend pointed out the Magic: The Gathering issue…in a bag and board, it felt extra-thick, so I snagged it for curiosity of the thickness (turned out it included a copy of the Acclaim Comics preview I’ll reference below). 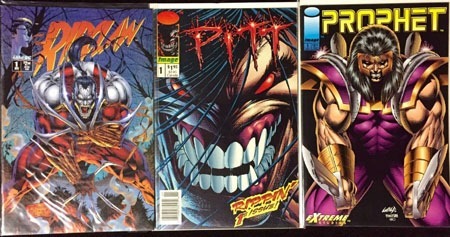 I also get a certain “satisfaction” out of scoring the “hot Image #1s!” of the early ’90s for a mere 25 (or less!) cents apiece. 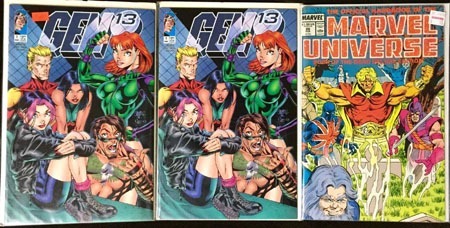 And speaking of…Gen13. I pretty clearly remember this issue being one of THE “hot” issues of its time…to the point that I now probably have bought 5 or 6 copies for 25 cents each just to retroactively stick my tongue out (figuratively) at all the people who may’ve paid $20, $30, even $40ish for a copy of the thing! 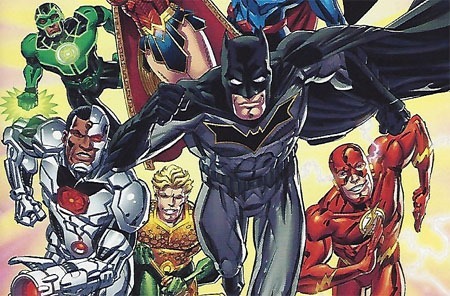 This week starts with a sort of one-shot, posing as an issue of Justice League. This issue is basically a “bridge” issue, taking Lex Luthor from one apparent status quo at the end of The Darkseid War and getting him into position for his role in Action Comics. We get a lot of narration from his side of things, making him definitely a sympathetic character…especially as he comes off–to me, on one reading–as actually being genuine, if not pure in his intentions. This IS Lex Luthor, after all…but I find it a lot easier to identify with this version of the character than I did the pre-Flashpoint one. Ultimately…it seems Luthor gave up rulership of Apokalips and all that would entail to return to Earth, to be a hero, a champion, to better himself such that he would make his sister Lena proud. Whatever else he is, whatever side things he might have going, whatever his methodology and such, he wants to be someone his sister can be proud of. And I kinda dig that. 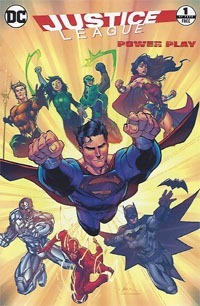 This issue is the second of this Rebirth run, yet both issues take place after the Justice League issue. 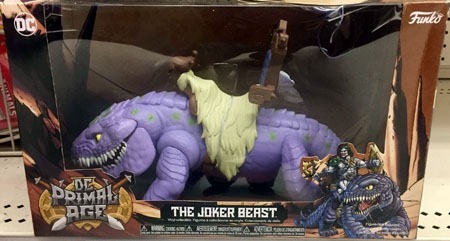 (Of course, JL apparently was delayed/late, so…your mileage on the matter may vary). 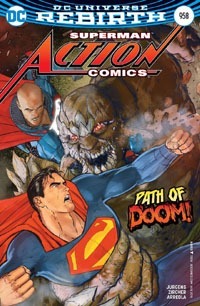 We have Superman and Luthor forced to team up against Doomsday, while various elements of the story are brought to bear. 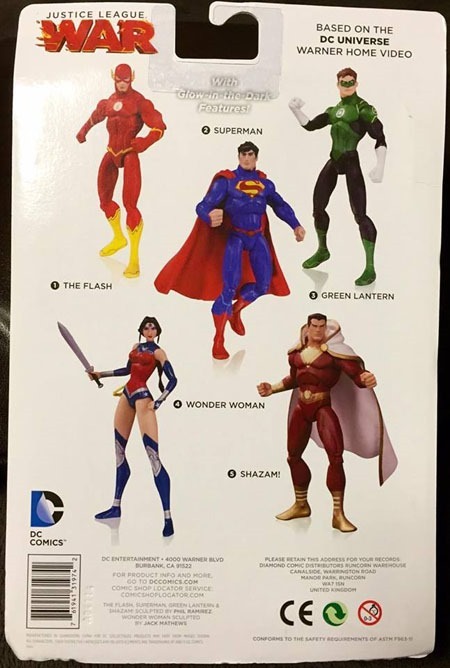 Who is this Clark Kent, and how is he separate from Superman? We as readers know, but characters in the story are left to wonder who this Superman is, given they’ve been told Superman is dead. Lois and Jon watch news of goings-on on tv, as Jon begins to learn a bit more about his father, and we see Lois trying to hide her worry so as to protect her son. 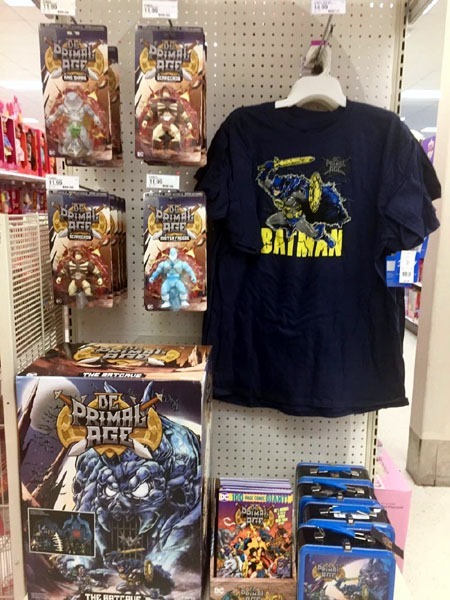 Because this is Doomsday, and seems to be THE Doomsday; somehow the same one that DID kill Superman, and not just some construct or entity that can turn into spores and be inhaled or infect someone. 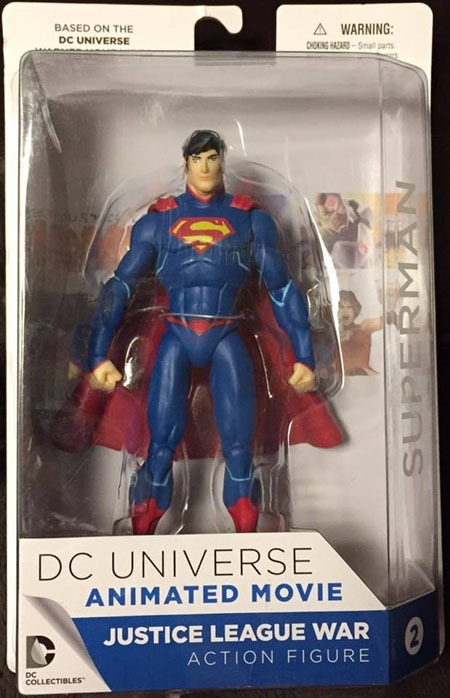 Superman–our Superman, this Superman, pre-Flashpoint Superman, recognizes the creature, feels its power, and is himself worried. 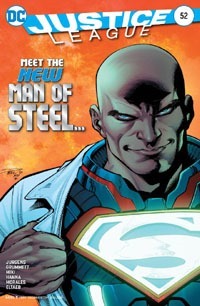 The issue ends with a cliffhanger that leaves me wondering where the story’s headed, and very interested in the questions half-raised by it in the back of my head…all ultimately stuff that enrichens Superman, Luthor, and the story as a whole. “Only” two issues in, and I’m quite enjoying this series. 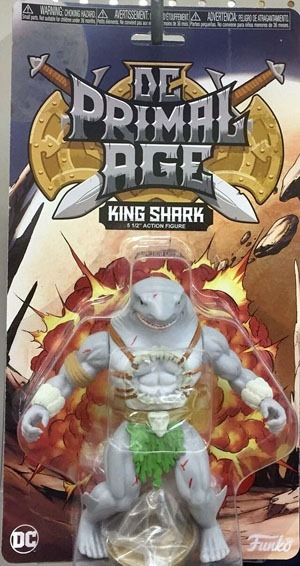 Like Action Comics, it feels like a flagship title again. 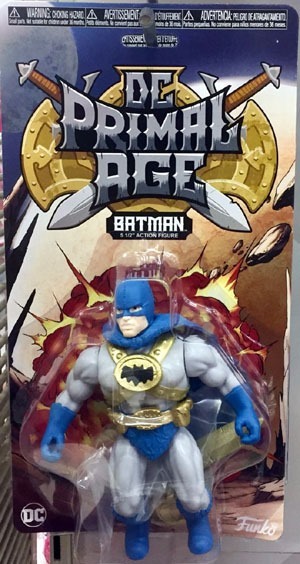 It is definitely, obviously a Batman book…but it’s more a “family” sort of title in that we have Batman, Batwoman, Red Robin, Spoiler, Orphan, and even Clayface in the mix. If I can’t have a Tim Drake as Robin/Red Robin solo book, I’ll absolutely “accept” his presence here…particularly seeing that there IS something between him and Stephanie…an element definitely missed since…too far back. I’m not too sure about Kate’s father and what’s going on there…but I’m interested in finding out. 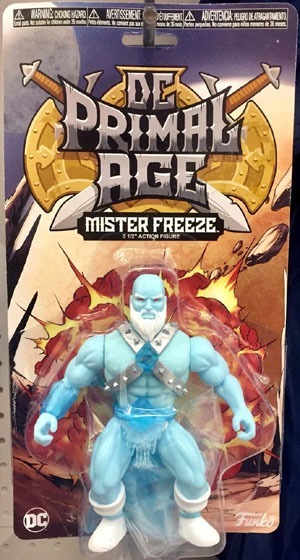 I like this mix of characters. I like seeing them, period. And I’m liking the art, and the story holds plenty of potential. I don’t like Marvel‘s double-shipping because of pricing and feeling “obligated” to a title or such. 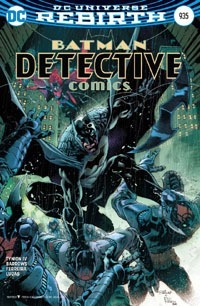 Here, with Detective shipping twice a month, I’m enjoying the story so far and am actually interested in the story, therefore getting another issue every two weeks is a rather welcome thing…especially with each issue “only” being $2.99 vs. Marvel’s $3.99. While I had bought the entire The Flash: Rebirth mini-series back in 2009 or 2010, whenever it was–I’ve never been a huge Barry fan. Comics-wise, I’m still not, in that he was GONE when I was introduced to comics, and despite occasionally short appearances (Time being wibbly-wobbly and all that) he served as inspiration for Wally and the rest of the Flash family more so than being present himself. But thanks to the tv series, the character has grown on me, and since I’ve quite enjoyed that and I see some elements of crossover, I’m enjoying this. 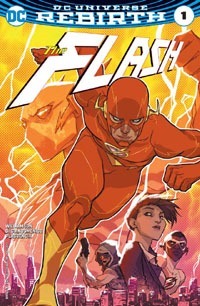 Granted, this is the first issue and only the second issue focused on the Flash in the Rebirth initiative thus far…so I’ve not had much to go on. 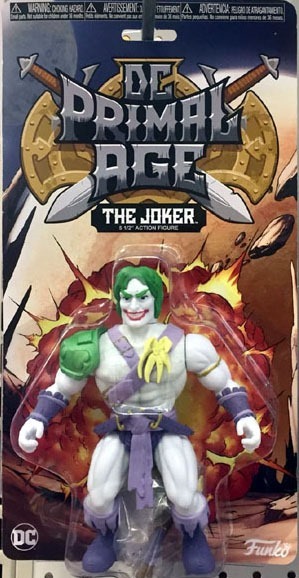 The story’s not put me off, and something about the art strikes me as something I would not care for with most other characters, but something to it simply “works” for this character. I’m also quite eager to see what all comes up with the fact of Barry being one of apparently only a few individuals to really know “something” is going on, that ten years have been stolen, and so on. That that mystery is something I’m expecting to be drawn out over a couple years makes this title–as a rarity–all the more interesting as a key part of details being learned. Possibly the most appealing thing–to me–of this issue is the cover. That’s a beautiful cover, definitely worthy of a poster. Despite that, I’m not sure at the moment if I’d consider it “iconic” or not…I suppose we’ll have to wait and see what the cover of #2 looks like, as well as other elements such as how the title will be collected…as at least for the first few, we’re going to have one story going on in the odd-numbered issues with a “Year One” going on in the evens. While the cover may be the most appealing part…I still liked this issue. It’s just not singularly-stand-out or anything. 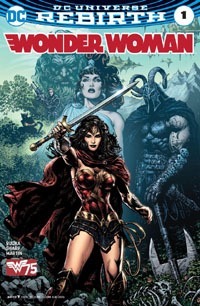 I’d quite enjoyed what I’d read of Rucka‘s Wonder Woman back around Infinite Crisis and such, but by the time of The New 52 and such, I’ve had no particular interest in the character…really only having anything to with the character by her presence in other stuff–mainly Superman–that I’d read. I’m still looking forward to this series–these first couple stories at minimum–but this is more of a passive enjoyment than an active “chomping at the bit for more” kinda thing. On this single issue alone I could probably take or leave the title if I had to…but having the next several issues coming (eventually) as parts of bundles, I do look forward to reading them and going from there. 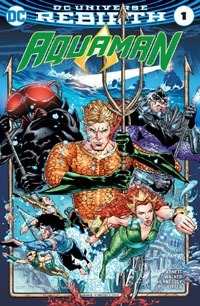 I’ve both been aware and simultaneously ignorant when it comes to a lot of Aquaman stuff…particularly longform continuity and back story. 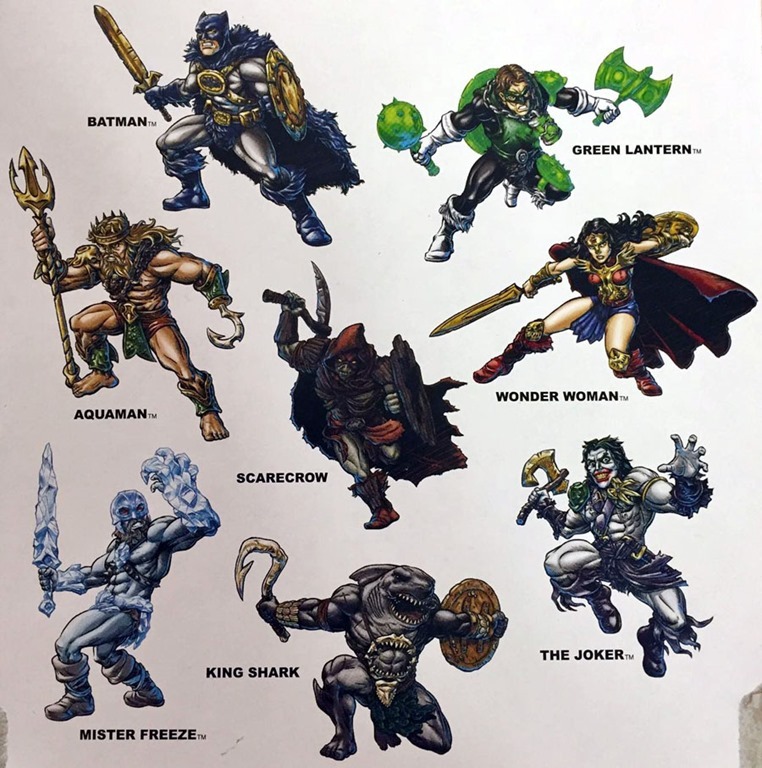 I have a couple mental images of the character from the early/mid 1990s of the long-haired, bearded, harpoon-handed period of the character. Despite a couple silver/bronze age issues of my grandfather’s that I’d come across the character, my main introduction to him was in Zero Hour, with a continued “awareness of” the character through the ’90s. 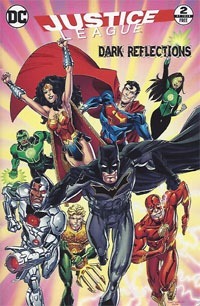 Which is all past stuff, and this is a new first issue, the Rebirth issue being a prologue. I don’t know these characters from much familiarity. 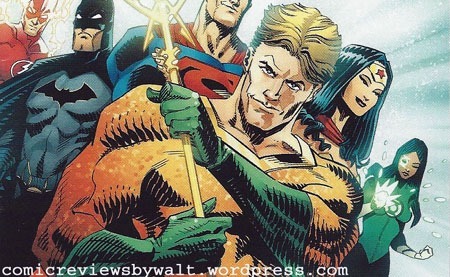 The whole Aquaman-and-Mera thing is recent for me, from Brightest Day. 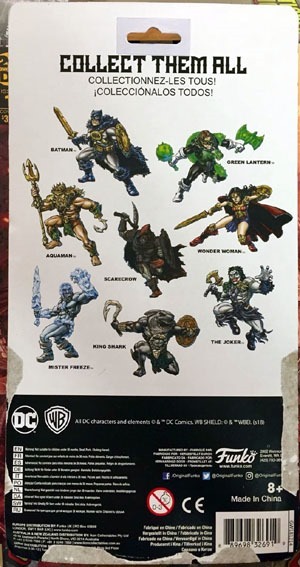 I’ve known OF Black Manta as a villain going back to early DC Heroclix days. 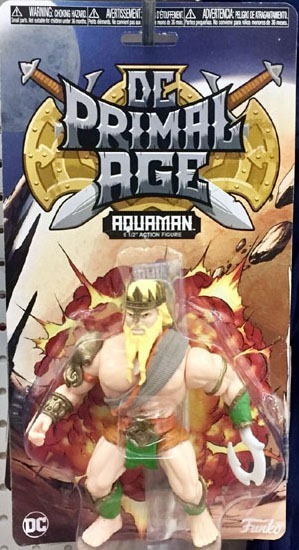 And I’m pretty sure somewhere I’d come across something about his history with Aquaman (I’m thinking Manta was the one that cost Arthur his hand in 1994). 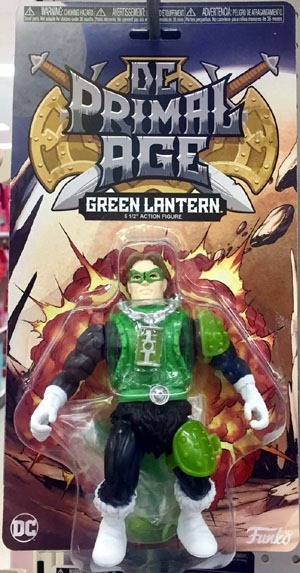 Which is alllll to say that I don’t have enough conscious background to really care much one way or the other for this character and his cast…except I’d heard good things about him with the start of the New 52 (though I never jumped in) and I consciously want to like this here, now. 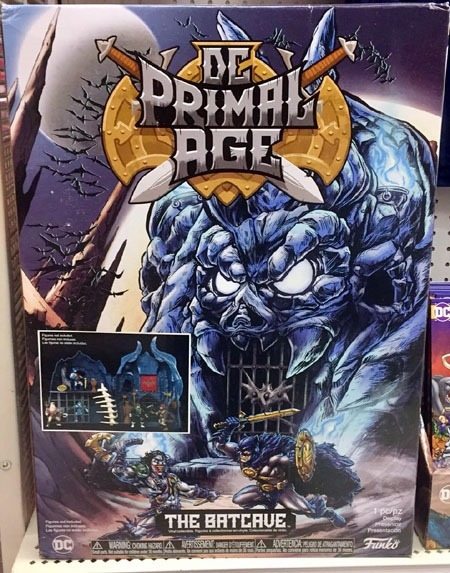 It’s a “good” issue, I’m definitely satisfied for my $2.99…but I’m just not EXCTIED by it. As part of a bundle I’m happy to keep reading the series…taken strictly in a pass/fail capacity I think this would be a “good, but just not my kinda thing for single issues” title. Another great week of stuff, with no major letdowns. I’m really glad that I ordered bundles starting with July because this is definitely way too much to keep up with, with any regularity otherwise. 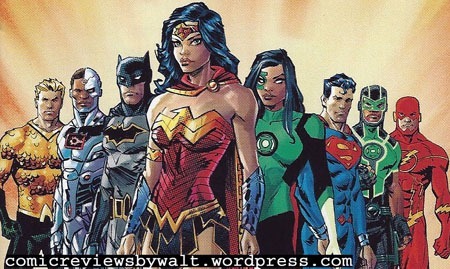 As with previous “special months” that DC has done, I will occasionally dive in with a bunch of stuff for that month…but to want to carry over fully into following months…this has not happened in a long time! 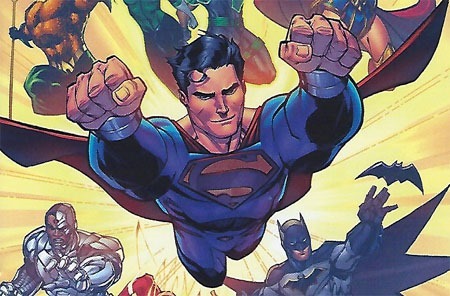 At this point, I’m thinking I will definitely throw support behind Action Comics and Detective Comics, as well as Superman–wherein even though I’ve ordered the bundles, I’ll still buy the singles day-of-release at the shop. (For what I’m saving on the bundles I still come out way ahead, price-wise). Only hard thing will be waiting for the end of the month and then cramming in the time to get everything read!